Card isn't good by any means but the flavor is awesome. Looks like Bolvar has an alternate play sound. Maybe it triggers when you play him against The Lich King in a Frozen Throne mission? I remember playing him in one of those random tavern brawls with pirates some time ago. Like Eadric the Pure This card isn't really bad, it's just that the extremely aggro meta and cards with insane value like Piloted Shredder, Dr. Boom, Big Game Hunter and such make it so that if you want to make a really competitive deck, it needs really powerful cards like Dr. 7 or cards that have insane combos *cough* Mysterious Challenger *cough* Force of Nature + Savage Roar *cough*, in addition to that, you cannot afford to have dead cards in your hand unless it's an OTK deck and you have some really really good suvival strategy like Antique Healbot + Gang Up or Shadowstep. When you get this card early in a brawl like the one with the discover mechanics + 2/3 pirates, you can afford to choose him to keep in your hand. The game is slow, with 2/3 cards trading all the time, which doesn't put any pressure on you, unlike playing against aggro decks, playing against slow, non-OP decks allow you to keep this card in your hand, and often develop it by turn 5 to a 6/7 or even 8/7 if you are lucky with Muster for Battle. Your opponent won't have a Big Game Hunter in their hand either, which means you don't have to be scared of playing it. Unfortunatelly Muster for Battle is going away. It's a big value loss for this card. In a more control-ish meta I'm sure this card has a lot of potential. Since we are expecting Blizz to nerf a lot of cards and with the super-value cards going away in GvG, hopefully we can get a slower meta where we can actually play more different, control decks, instead of the 3-5 aggro/combo decks being played by everyone right now, and I think that this card might actually see a lot of play in Paladin decks if that happens. Why isn't he a 2/7? It wouldn't make him OP but he could still be of some use when he's silenced/unbuffed, like Frostwolf Warlord. Faceless Manipulator on this card made it a 2/7? I thought it would clone the attack power, but sadly it did not. Still a solid card in my deck. Tell them , that the Lich King is dead. 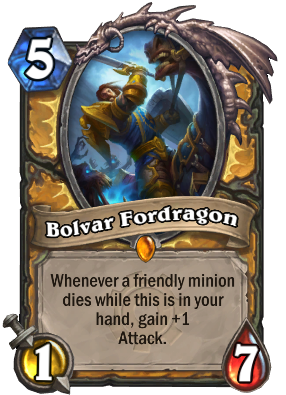 And the Bolvar Fordragon died with him. Can you have two of these in one hand? Sorry if that's an ignorant question. I imagine you could, if by chance a Spellslinger gave you Duplicate. There are a few other ways I guess, but none of them reliable off the top of my head. I once got a second Bolvar Fordragon from using Grand Crusader. I already had one copy in my hand, so the way it played out was pretty epic. I dropped the second copy first that was maybe 6/7, after he was cleared followed with the first copy that had been in my hand early so it was 25/7ish. That is EPIC! haha! love it! I like the art. Is that him smacking a scourge warrior at the Wrathgate? Does Hobgoblin buff this card when it being play? Silence hurts him too much. His base attack should be higher than 1.
i like the synergy with muster and the silverhand recruits. There will be a time that Bolvar will show his true value and all those who blamed him will regret it. Keep dreaming. Bad cards are bad cards.